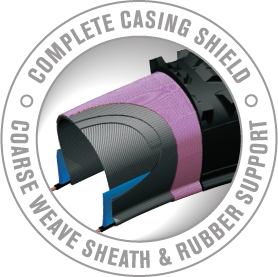 Velowürks Complete Casing Shield is our toughest sidewall treatment for aggressive riding and rugged terrain. Lighter and more supple than a full DH double carcass, CCS features a 40 x 40 course weave canvas layer bonded to the tire carcass from bead to bead protection against cuts, abrasion and pinch flats as well as sealing the tire for tubeless use. But wait, there’s more! Dual rubber sidewall supports extend from bead to tread stabilizing the sidewall during hard cornering and providing additional support against pinch flats when running low pressures.